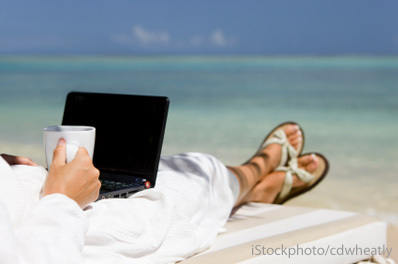 Do You Need Your Tablet or Laptop to Have a Good Vacation? The ubiquity of mobile devices has changed society in so many ways, for better and worse. Some of our biggest pet peeves are now people who have cell phone conversations in confined public spaces or people who text while walking or driving. Yet many of us have gladly done away with land lines and now enjoy turn-by-turn navigation on our phones or tablets to get us where we need to be—a vast improvement over the days of using a paper map. Indeed, mobile devices can markedly improve travel. You can sit at an outdoor café in Athens overlooking the Parthenon and find your hotel for the night with a few taps in your Trip Advisor app on your smartphone. Or you can use Google Maps on your tablet to see exactly where you are in midtown Manhattan relative to the closest subway station. But is our reliance on our mobile devices for travel getting out of hand? According to a new survey conducted by Intel, U.S. vacationers will go to great lengths to bring them along and find places to charge them. And if they can’t use them, it’s cause for distress. The "Intel Survey: Tech Norms for Travelers," specifically exposed the obsession travelers have with their Ultrabooks, laptops and tablets and found that Americans are emotionally attached to these devices to the point of being less stressed when they have them available while vacationing. Almost half (44 percent) said they feel anxious traveling without their Ultrabook, tablet or laptop and 87 percent of young adults younger than 30 are happier when traveling with their devices. Losing these mobile computing devices when traveling is more stressful than losing a wedding ring, according to the majority of respondents. Almost half of travelers (46 percent) and 63 percent of young travelers admit compromising their personal comfort and hygiene to find a power source to keep their device charged. This means people are choosing a restaurant or coffee house based on outlet availability, looking for outlets in public restrooms (yuck! ), as well as trading comfort and hygiene to sit on the floor near an outlet. Sixty-four percent said if space in their luggage was limited and they had to choose between bringing along their device or things like hair dryers or styling tools, toiletries, sunscreen, workout clothes and even shoes, they’d pick the device. More women than men says it’s “very stressful” when they lose a mobile computing device compared to men (82 percent vs. 73 percent). Thirty percent don’t think they need to power off their devices when they fly. Thirteen percent of young travelers admit to "hogging" an available power source. Forty-six percent of travelers say their biggest pet peeves about traveling with technology relate to device security, including worrying the device may be lost or stolen and someone glancing at their screen. This concern rises to 62 percent among young adult travelers. About that last one, there’s the rub. Yes, you can use your tablet to navigate while walking the streets of some busy metropolis, but is doing so really safe? It’s worth hundreds of dollars and in any large city there are inevitably malefactors who are looking for things to steal. Therefore, it’s probably prudent to stow your expensive device when you’re not using it. And yes, you can smash your laptop into your cramped luggage and forgo bringing running shoes that you can use on the beach, but if it’s truly a vacation, what’s the point? Do you need it so as to work while on holiday? If you’re lugging along a laptop just to surf the Web or post on Facebook, maybe you should consider making your getaway one that takes a break from digital media as well. As for the finding that people will scour public bathrooms for an outlet to charge a device or choose a place to hang out based on the availability of power, here’s a tip: Before traveling, invest in a backup battery. The Innergie PocketCell is one of many available at Amazon; it’s only $59.99 and powers many portable devices. Your thoughts? How comfortable would you be traveling without a mobile computing device in tow? I’ve seen this dependency increase for myself as well, and my last trip just a couple of weeks ago had me compromising comfort and good food to ‘snag’ an open seat along the wall at the airport during a layover…that had an electrical outlet next to it. And right along with the premise of your article, I have to note that those seats are really hard to get because everyone else wants to sit there and power up/use their devices, as well. I love your advice about leaving the electronic device I am (even though the thought of it made me panic a bit). Hello, my name is Julie, and I'm a tech junkie! Wow! And I thought I was a tech junkie! What do you do with three iPods plus an iPhone? For your kids? Well, no, the only kid is 23 and living in Canada! I have the 5th Gen iPod - holds all my movies. Then got an iTouch - holds mostly my books and music (a couple of movies). And my iPhone is mostly for games and photo and phone purposes - and some internet! I collect things (movies, music - you know!!!!)! Part of every trip has to do with photography. Photography plays an important role in our choice of vacation destinations. I carry enough cameras and assorted support equipment for two of us. Since we generally review our pictures after a day of beach or boating or hiking or whatever, a laptop is an important part of our trip. We also carry a Kindle and a Fire, but we use those as substitutes for the pile of paperbacks we would otherwise have packed. I do check my email occasionally, but for us, the electronics are an integral part of what we expect from a trip. Oh yah, I don’t know HOW I forgot to not list all the camera and camera equipment along with everything else - I do photography and scrapbooking - usually have my Canon 3D, 6 lenses, Tripod, Unipod, my little Nikon, a bunch of memory cards, and of course, I also grab my iPhone for quickies!!!! And the hubby uses his Sony and his iPhone also… Guess I don’t normally put those in with “electronics”! But, the laptop is essential for that every evening also! I would feel lost without my ipad.. connect with local hotspots, not the the tourist stuff. ( especially restaurants and off the path boutique shops. Also I was hoping with my new ipad app: helloalbums, users would create their own ” little memory books” before they leave, on the plane, train, car.. Although I would be able to do it, it would be very hard to go a week without my computer and internet connection. It would be a week of withdraws!